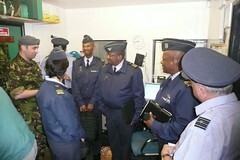 2425 Squadron was visited by Major General Msimang, Chief Director Air Policy and Plans for the South African Air Force as part of the South African Air Force’s fact finding mission on what makes a good youth organisation. The general and his staff were escorted by Sqn Ldr McNeill MBE, from HQ Air Cadets, RAFCranwell and Wing Commander Dickenson OBE, OC South and East Midlands wing. As part of his visit Major General Msimang was asked by the Squadron commander to present Cadet Major with his Sergeant tapes. “I’ll never forget getting promoted by a Major General” said Cdt Sgt Major. On departing the Squadron Major General Msimang said “In my country an organisation like the Air Training Corps would not only change lives but probably save them too, you young people are very lucky and a credit to your Squadron, organisation and country”.